By the nationally best-selling author of "The Seven Daughters of Eve," "Adam's Curse" investigates the ultimate evolutionary crisis: a man-free future. How is it possible that the Y chromosome, which separated the sexes and allowed humans to rise to the apex of the animal kingdom, also threatens to destroy sexual reproduction altogether? Bryan Sykes confronts recent advances in evolutionary theory to find the answers to the questions that inexorably follow: Is there a genetic cause for men's greed, aggression, and promiscuity? Could a male homosexual gene possibly exist? A must read for anyone interested in popular science, family genealogy, and today's infertility crisis, "Adam's Curse" provokes a shocking debate on the nature of sexual reproduction. Book Details: 320 pages, 6 illustrations, paperback / softcover, W.W. Norton & Co. 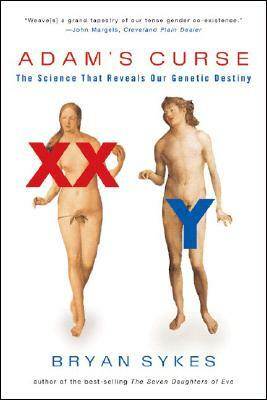 Description: The inside story of the Y chromosome's fatal flaw, as told by one of the world's leading geneticists. By the nationally best-selling author of The Seven Daughters of Eve, Adam's Curse investigates the ultimate evolutionary crisis: a man-free future. How is it possible that the Y chromosome, which separated the sexes and allowed humans to rise to the apex of the animal kingdom, also threatens to destroy sexual reproduction altogether? Bryan Sykes confronts recent advances in evolutionary theory to find the answers to the questions that inexorably follow: Is there a genetic cause for men's greed, aggression, and promiscuity? Could a male homosexual gene possibly exist? A must read for anyone interested in popular science, family genealogy, and today's infertility crisis, Adam's Curse provokes a shocking debate on the nature of sexual reproduction. Bryan Sykes is professor of genetics at the Institute of Molecular Medicine at Oxford University and the author of the national bestseller The Seven Daughters of Eve. He lives in England.